Patterns are found everywhere in nature and in our built world. Shapes repeated over and over again in Interlocking patterns are called tessellations. To tessellate means to form or arrange small shapes in a checkered or mosaic pattern. The original shape known as the fundamental, or primary cell is repeated to fit together exactly without gaps or overlaps. Early tessellations from ancient cultures were made of square tiles. Johannes Kepler was the first to write about tessellations in 1619; he wrote about the two dimensional covering of a plane with interlocking polygons. 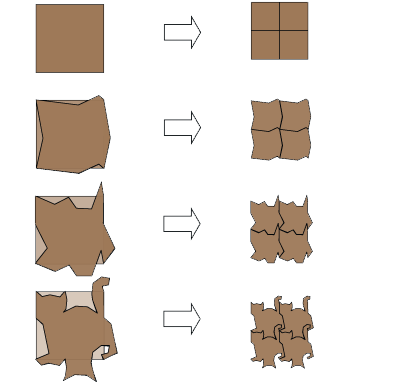 In 1891, E. S. Fedorov proved 17 different groups of isometries (or ways of repeating polygonal tiles in a plane). Today scientists and mathematicians study symmetry issues of tessellations for use in quantum mechanics. Designers use tessellations in the design of objects, systems, and environments. Power up with pattern! Try to tessellate! The artist M.C. Escher is famous for many of his tessellations of irregular shapes, including fish to birds, even lizards. Research Escher’s tessellations using some of the websites listed below and create one of your own. Any shape is possible. Remember to make a primary cell and a mate. 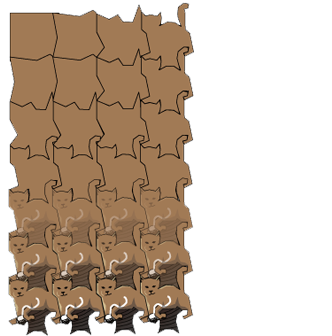 Cut the pieces out of cardboard and color. Use your imagination! You can possess the power of pattern! All things are connected! Take a piece of cardboard or foam board and draw a grid of nine rectangles. Draw a line across the bottom of the middle rectangle that goes above and below the line (see example). Copy this line along the top of the rectangle. Cut this shape out. You have created a primary cell! Take this shape and place it in the center of a new piece of paper with a light grid of the same size rectangles drawn on it. Trace around the shape. Pick up the shape and fit it like a puzzle piece above your drawing and trace it again. Now pick it up and place it below the drawing and trace it again. Continue to trace around the shape each time to create a pattern like the one shown. Color the shapes in different colors. Turn one thing into another. Activity 3 – create an eco tessellation! Experiment with shapes and colors. Think about relationships and improving relationships between things that you know and things that grow. Mosaics are made of square shaped tiles. To tessellate means to piece together. 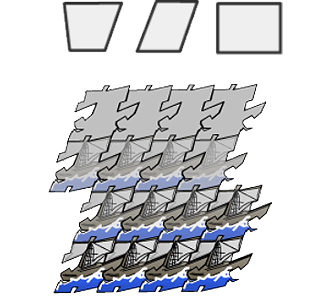 The primary cell is the first shape in a tessellation. Bathroom tiles are sometimes an example of a tessellation. Kepler first wrote about tessellations in 1619. PBS Can' Wait to Tesselate!